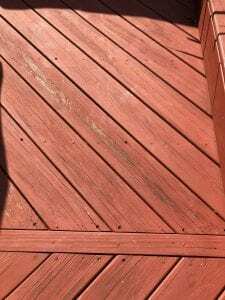 Can you apply stain to a deck that is painted? The answer is not immediately. Whether you are looking to change the color or brand of stain on your deck or you are simply looking to treat your deck with a fresh coat of stain, you absolutely must remove all layers of paint or solid stains that are already on the wood. Otherwise, the quality and performance of your paint job will be compromised and you will end up having to stain all over again. So, just remember to remove any existing stain from the wood surface before tackling a new paint job and you will be all set! There are two ways to remove the existing stain on a deck and you may need to do both to remove all of the solid stain or paint off your wood. The first way is to try using a high-quality deck stain stripper. Choosing a high-quality stripper like Restore-A-Deck Stain Stripper makes removing deck stains a breeze. To prepare the stain stripper, follow directions on the packaging and mix until crystals are fully dissolved. If you are using a pump sprayer, mix the stain stripper in a separate bucket before transferring to the sprayer to avoid clogging. To apply the Stripper, mist a layer of fresh water onto the deck then apply the stripper to the wood surface using either a pump sprayer or scrub brush. This is the most effective way to apply the stain stripper. Allow the compound to sit on the wood surface for 10-15 minutes or until the surface becomes slippery. Pressure wash or vigorously scrub by hand until all the dirt, grime and fibers are removed. We recommend power washing over hand scrubbing, as it is easier and more effective. Repeat this process to most or all old stain or sealer over stubborn areas. After stripping as much as you can of the solid stain, apply Deck Brightener to neutralize the pH and restore the natural beauty of the wood. This doesn’t need to be power washed, simply rinse off after applying. The second way to remove a solid stain or paint from a deck is by sanding it. If your wood deck has many layers of paint from projects over the years and withstands damage, you must sand the wood down to its original surface before applying stain or paint. We recommend renting a drum sander to make the job a little less laborious. After sanding is complete, you may use a deck cleaner and wood brightener for the final prep.